The ACCC also alleged that the overall impression created by the advertisements was that the discount would apply while the consumer remained a customer, when in fact the discount only applied for 12 months, after which it dropped to 25 per cent. These advertisements appeared on television, radio, Facebook, Spotify, billboards, bus panels and emails. Some advertisements contained a reference that “Ts &Cs apply” while others included references in fine print explaining the deal. 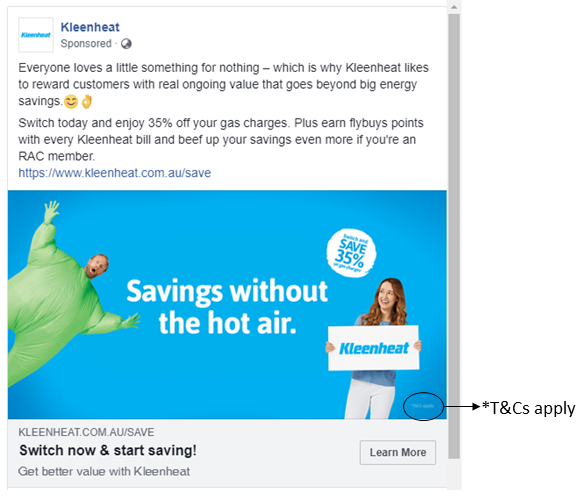 Kleenheat is Western Australia’s second largest gas retailer, and thousands of customers took up the Monthly Energiser Plan after the advertisements, which have now been withdrawn. “The ACCC alleges that Kleenheat made representations to potential customers which were false and may have caused some people to switch their account to Kleenheat from other gas suppliers,” ACCC Acting Chair Roger Featherston said. “Qualifications which explain the terms and conditions of a deal must be prominent and not only in fine print, so that consumers understand what the deal involves,” Mr Featherston said. The payment of a penalty specified in an infringement notice is not an admission of a contravention of the Australian Consumer Law. The ACCC can issue an infringement notice where it has reasonable grounds to believe a person or a business has contravened certain consumer protection laws.